If you have completed the Level 1 Introductory Course then this class will continue with the dances already learnt and introduce some new rhythms too. Every Thursday night, it's just pay as you go. Intermediate & Advanced levels also. Venue: Broadbeach Seniors Hall, T E Peters Drive, Broadbeach. Air-conditioned Venue. Argentine Tango is such a beautiful dance style - passionate and romantic with a rich culture. At NYB we give beginners the opportunity to learn the basics in a private studio. Advanced dancers will learn choreography suitable for the social Milonga. 2 levels of learning: Beginner / Advanced. Venue: Studio- 5/61 Upton Street Bundall. Air-conditioned Venue. Everyone loves a little extra Salsa! Salsa is one of the world's most famous dances. A spicy blend of Cuban and African influences, Salsa is a fantastic style for dancers just starting out, and challenging enough to keep even pros coming back for more. Advanced dancers will delight in the flourish and excitement of improvisation, while beginners will be pulling off thrilling spins and dips at the nightclub in no time. Everyone can get wrapped up in the sensation that Salsa moves create on the dance floor. This 6 week course has a beginner level and an advanced level. No partner is necessary and no dance experience is required! Both courses start on 10 April 2019. Next courses start on 22 May 2019. Beginner/Intermediate & Advanced. 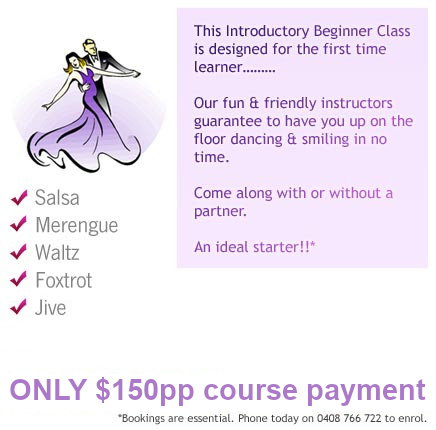 Learn Waltz, Tango, Foxtrot, Quickstep, Cha Cha, Salsa, Rumba & Jive. Two dances taught each week with the dances changing every three weeks. Beginners welcome. Come with or without a partner. Couples are welcome to stay together. Singles may rotate partners throughout the class. Beginners: Beginners are catered for in a class of their own. Learn the basic skills of the dances at a social level. We have friendly patient instructors happy to welcome the beginner. Join in at any time. Intermediate This next level advances the patterns and techniques learnt in the beginner level introducing new figures and steps in each dance. It is recommended that dancers feel proficient at this level before moving into the advanced group. Advanced More advanced choreography is taught with emphasis given to technique, partnering , leading, following and floorcraft. It is recommended that dancers have completed our intermediate level before joining in with the advanced group. Medals are an excellent award system for achievement in dance. NYB runs courses which develop technical skills, sometimes difficult to be taught in social classes. These courses are categorised by the dance style. It is the next step from the social class learning environment, with more concentration given to the skills required to be a more competent dancer. These classes are in a course structure and concentrate on a particular style of dance. A set combination of steps is taught during the course. Elements covered include foot patterns, footwork, alignments, lead and follow, characteristics, technique and floor craft. A 13 week course can exercise the advantage of repetition and consolidating routines which can then be used as a base pattern of each dance. Social classes may then add variety with extra figures and steps. This is the perfect combination of the technique from the Medal work, and then expanding the choreography base in the social class with the experience of dancing with different partners of all levels. 1st term's medal exam will be on Saturday 27 April 2019. 2nd term's medal exam will be on Saturday 24 August 2019. 3rd term's medal exam will be on Saturday 14 December 2019. Each course is $200. Contact the studio for further details or to book. at Broadbeach Seniors Hall, T E Peters Drive, Broadbeach.